Do you constantly feel exhausted during the day despite how much you sleep? Does your bed partner complain about your loud, chronic snoring, and you often find yourself having problems with your memory or focus at work? Has your tiredness almost caused you to fall asleep behind the wheel? If so, then you may be suffering from sleep apnea, the second most common sleep disorder in the entire world. Research estimates that about 20 million Americans deal with it every night, robbing them of their much needed rest and health at the same time. 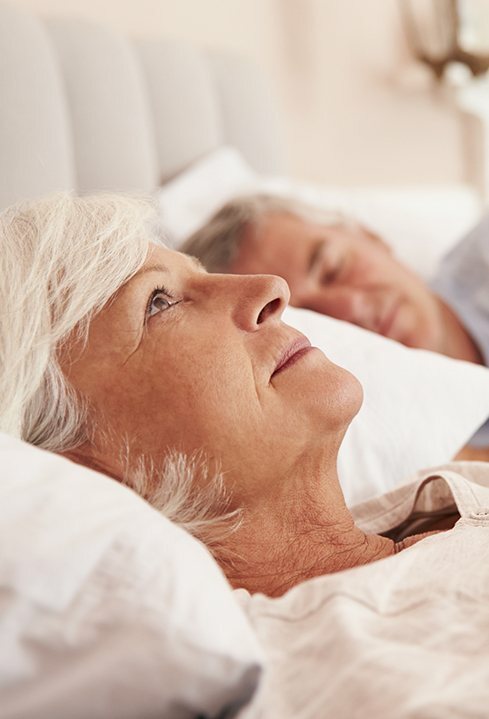 At Aesthetic Family Dentistry, we’re able to help patients overcome snoring and OSA using a small, custom-made dental device that is only worn to bed. Dr. Hutto has undergone an extensive amount of special training to provide this kind of care, and he has already helped countless patients using this treatment. To learn how we can help you reclaim the night and your quality of life, read on below. Obstructive Sleep Apnea occurs more commonly in men than women and is caused when the airways collapses or becomes blocked, effectively stopping the ability to breathe. This happens at night when the individual is asleep, resulting in multiple instances of the individual being forced to wake up or partially wake up to restore normal breathing. Most patients don’t remember the pauses in breathing or rude awakenings in the morning, though. The muscles of the tongue and throat naturally relax when we sleep, but for those with OSA, this relaxation causes the skin and muscle at the back of the throat to drop, restricting or blocking the air passage. The signs of OSA are often difficult to identify if you sleep alone. The most common symptom is heavy snoring, often with periods of breath stoppage and then rapid breathing or a sensation of choking. Other symptoms can include a chronic dry mouth, difficulty in remaining awake during the day, memory and focus problems, headaches, and the possibility of restless sleep habits. While some people may need specialized equipment such as CPAP (Continuous Positive Airway Pressure) to alleviate their sleep apnea, which includes a mask that is worn when sleeping that forces air through the nose and mouth to stop the collapse of the airway, others may benefit from the use of a very comfortable dental device known as a SomnoMed sleep appliance. This device helps you avoids the possible complications of a surgical procedure and is often much better tolerated by patients than the CPAP, which can be bulky and difficult to use. Dr. Hutto will ask you a few simple questions and complete an examination to see if this lightweight mouthpiece may be the best option for your OSA. It can also be used to stop snoring comfortably and allow you to have a restful, deep, and continual night’s sleep.